Once an ITS project has been funded and implementation begins, there is a natural tendency to focus on the programmatic and technical details of the project to be implemented and lose sight of the broader regional context for the project. Using the regional ITS architecture as a basis for project implementation provides this regional context. It provides each project sponsor the opportunity to view their project in the context of surrounding systems. It prompts the sponsor to think about how their project fits within the overall transportation vision for the region. It identifies the integration opportunities that should be considered and provides a head start for the systems engineering analysis that is required for ITS projects. Due to these potential benefits, the Rule/Policy requires the regional ITS architecture to be used for project implementation. Specifically, FHWA Rule 940.11.c.1 and FTA National ITS Architecture Policy Section 6.c.1 require identification of the portion of the regional ITS architecture that is implemented by each ITS project. As described in previous sections, transportation projects are identified and funded through transportation planning and programming/budgeting phases. Funded projects are then implemented using a project development process that will vary with the type of project. For example, ITS projects that install field equipment (e.g., installation of variable message signs) use a process that is very close to the traditional project development process shown in Figure 41. ITS projects that include hardware and software development and integration will require additional systems engineering analyses that can be thought of as extensions to the traditional project development process. While project development processes vary from state to state and from organization to organization in each state, the transportation project development process tends to have the same major steps. Project Initiation — At this step, the project manager is identified, the project team is assembled, and the project development is planned. A high-level definition of the project is developed, costs are estimated, and the required forms and checklists are completed to garner approval for the project from the sponsoring and funding agency(ies). For FHWA and FTA, this is a critical point in the process where approval to proceed is given and federal funds are obligated. For the project sponsor, this is the best opportunity to consider integration opportunities and use the regional ITS architecture to inform the initial project scoping and definition. The regional ITS architecture can be used to define the project's scope at this step — identifying the involved stakeholders and high-level roles and responsibilities, the portion of the regional ITS architecture to be implemented, and where in the project sequencing the project is identified. Preliminary Engineering — In the traditional capital project development process, environmental, right-of-way, and other studies are performed depending on the type of project. These studies result in better understanding of the project requirements and constraints. ITS projects that include a construction component will require these same studies as well as additional engineering analyses to fully specify the project requirements for the ITS portion of the project. The regional ITS architecture can contribute to these preliminary engineering analyses since it includes high-level functional requirements and interface definitions that can be used as a starting point. Note that from a federal aid perspective, "preliminary engineering" also includes PS&E. PS&E is split out separately here to differentiate between requirements and design steps in the traditional development process. Plans, Specifications, and Estimates — The detailed design for the project, complete with detailed project specifications, estimates of material needs, and associated costs are documented. In a traditional construction project, this process step provides companies with all the information they need to develop an accurate bid. Construction elements within an ITS project will also require traditional design documentation (i.e., layout sheets, plan and elevation views, cross-section details, etc.). Design documentation is also required for the hardware and software components in an ITS project, but it takes the form of high level design, interface specification, and detailed hardware and software specifications. The architecture provides some input at this step, including information about ITS standards that may be relevant to the project. Construction — The project is built. For a traditional transportation project, this is construction of the actual physical improvement. For an ITS project, this includes the implementation of the actual hardware, software, and enabling products (e.g., manuals, operating procedures, and training). This step also includes inspection of the physical improvement(s) and integration and testing of the implemented system(s). Project Closeout — After final inspection/testing, the completed project is accepted, as-built plans are created, and a project history file is completed. As shown, the best opportunity for use of the regional ITS architecture is early in the development process when the project is initiated and preliminary engineering is performed. The architecture is most valuable as a scoping tool that allows a project to be broadly defined and shown in a regional context. In later steps, when the project scope is firmly established and the project is defined in increasing detail, there is less opportunity to use the high-level definitions included in the regional ITS architecture. More detailed guidance for using the regional ITS architecture at each step in the project development process is defined later in this section. Project Sponsor — This is the agency or group that advocates for a project and is responsible for project development. This could be any agency in the region — cities, counties, state DOT, public safety agencies, etc. Architecture Maintainer — This is the agency responsible for supporting and maintaining the regional ITS architecture. This is typically an MPO or State DOT. Project Manager — The individual with responsibility for project delivery, who manages the project so that it meets schedule and cost requirements and satisfies customer needs. Project Team — The people that work on the project including staff from the participating agency (or agencies), consultants, and contractors. FHWA/FTA Division Office — The division office is responsible for administration, oversight, and technical assistance for projects that use highway trust funds, ensuring that these projects meet federal requirements, including the FHWA Rule/FTA Policy. Regions must address a few challenges if the regional ITS architecture is to be used effectively to support project development. Across the country, regions are each encountering the same challenges and best practices are beginning to emerge that will encourage beneficial use of the architecture. Six challenges and their corresponding solutions are described below. Challenge: While architecture maintenance responsibilities normally rest with a single agency, many agencies in a region are Project Sponsors that will need to use the architecture. Solution: If it is to be used, the regional ITS architecture must be readily available to all Project Sponsors in the region. The latest version of the architecture should be available in a location readily accessible to all Project Team members. An architecture web page that provides access to the latest architecture information and resources is ideal. The form of the regional ITS architecture documentation should allow easy cut-and-paste into project documentation. Challenge: Each of these Project Sponsor agencies has its own development process that must be adapted to use the regional ITS architecture if architecture use is to be systematic in the region. Solution: The points at which the architecture should be used in project development should be formally documented for the state or region. In particular, an early checkpoint should be identified where the Project Team should have considered the architecture as the project scope is established so that integration opportunities are considered for each ITS project. A later checkpoint should be established where the Project Team should have verified that the as-designed project is consistent with the architecture and identified any regional ITS architecture changes that would be required to achieve this consistency. The FHWA/FTA Division Office should play a leading role in defining these points in the process, integrating architecture use requirements with existing federal oversight requirements. Such top-down inclusion is the only way to ensure systematic architecture use by all Project Sponsors in the region. Challenge: The Project Manager and Project Team may have little or no experience with the regional ITS architecture. While the architecture development process is inclusive, smaller agencies may not have participated, and only a few individuals from participating agencies actually develop expertise with the architecture. Staff turnover can further dilute architecture expertise over time. Solution: Although not everyone will be an architecture expert, at least one member of every Project Team must be able to effectively use the architecture. If the Project Team does not have this expertise, then technical assistance must be provided by the Architecture Maintainer, FHWA/FTA Division office, or another resource to identify the relevant portion of the architecture for the project. To facilitate architecture use, the region should make the architecture as easy to use as possible, document instructions for use in project implementation, and make technical assistance and training available to Project Teams. The architecture documentation should be reviewed with a critical eye towards ease of use by Project Teams and revised as necessary to better support this critical use. Regions may find that their architecture is technically sound but should be revised so that it can be more easily used by Project Teams. In particular, it should be easy for users to navigate from one part of the architecture documentation (e.g., a particular inventory element) to other related parts (e.g., functional requirements, stakeholders, and interfaces). The architecture should be supported by a roadmap for architecture use that can be used by each Project Team. The roadmap for architecture use includes step-by-step instructions for how the region's architecture documentation should be used for project development. Turbo Architecture can be used to identify the portion of the regional ITS architecture that is included in a project, if the Project Team has access to Turbo Architecture and is familiar with its use. While this is an excellent way to use the architecture, it is unlikely that every Project Team will have access to the Turbo Architecture software or be able to use it without some training. The region must account for Project Teams that may not have Turbo Architecture expertise when establishing their process for architecture use. Ease of use should be coupled with an effective technical assistance program that allows Project Teams to get the assistance that they need when they have a question about architecture use. As technical assistance is requested and provided, it is a good idea to continue to enhance the documentation available to every Project Team with a set of frequently asked questions and answers that can further facilitate future use. Larger agencies should consider having an ITS specialist that can participate on ITS-related Project Teams and support architecture use as well as appropriate application of the systems engineering process and ITS standards. The ITS specialist becomes another specialist in the range of environmental, legal, and technical experts that are included on the Project Team, depending on the type of project. Training in the region's ITS architecture, with focus on how to use the regional ITS architecture, should be available to Project Sponsors. This guidance document and the National ITS Architecture training course include general information on architecture use that could be used as a starting point and tailored to focus on the region's architecture and ITS project development process. To ensure expertise by consultant members of the Team, include RFP requirements for knowledge/experience with regional ITS architecture and its use in ITS project procurements. Challenge: ITS projects are location specific and the regional ITS architecture is normally defined at a higher level. For example, many different projects may implement field equipment that is generally represented with a single inventory element in the regional ITS architecture as shown in the comparison of Washington State DOT regional ITS architecture inventory elements with Washington State DOT transportation projects in Figure 42. As shown, there are many projects that are implementing transportation improvements in the region covered by the two WSDOT field equipment elements. Solution: In order to effectively use the architecture, the Project Team must bridge the gap between the higher-level regional ITS architecture and the relatively specific definition of a particular project. The different levels of abstraction are a potential stumbling block that should be addressed in the region's guidance for architecture use. For example, the project block diagram in a concept of operations may be more specific than what is represented in the regional ITS architecture, but still traceable to the regional ITS architecture. While it is sometimes beneficial, you should proceed with caution when adding detail to your regional ITS architecture so that it more precisely depicts individual projects. For example, a city may deploy field equipment with ten different projects over the course of several years. It is probably a mistake to include ten different inventory elements in the regional ITS architecture that specifically represent the equipment in each anticipated project. This would add too much detail to the regional ITS architecture and make it more difficult to maintain. Challenge: Some ITS projects do not use the Highway Trust Fund and are not subject to the Rule/Policy requirements. Projects developed exclusively with local funds and projects developed by non-transportation agencies (e.g., public safety agencies) fall into this category. For these projects, use of the architecture is strictly voluntary and can only be motivated by the potential benefits of use. Solution: Information on the benefits of architecture use should be available to every project sponsor, not only those who sponsor projects that use the Highway Trust Fund. Some agencies, such as Virginia DOT, have developed a user guide that encourages architecture use for ITS projects, whether or not Highway Trust Funds are used. To coordinate public safety projects, SANDAG, the San Diego MPO, has established a public safety committee that coordinates planning for public safety integration projects with SANDAG. The architecture maintenance activity should periodically update the architecture to reflect other ITS projects that have been implemented so that the architecture continues to accurately reflect ITS implementation in the region. Challenge: Some common projects that are categorized as ITS, like signal synchronization projects, impact only a single agency system and have lesser need to use the regional ITS architecture. Multi-modal or multi-jurisdictional projects that connect systems from different agencies. New system developments that must consider future integration requirements. There is some potential benefit from architecture use on even the simplest ITS projects. For example, signal synchronization projects may benefit from architecture use in regions where integration of adjacent traffic signal systems is planned. The FHWA/FTA Division Office determines how the Rule/Policy should be applied to different types of ITS projects in the region. For example, the California Division Office has established oversight procedures that require architecture use for all ITS projects, but only require direct oversight for higher risk "major" ITS projects. Some regions have established graduated processes where more detailed architecture use is suggested for more complex projects. For example, Virginia DOT has established guidelines for architecture use that require project architectures for more complex projects that include more than three stakeholders. An early project initiation checkpoint should include information about the project that allows project type and complexity to be determined so appropriate architecture use and systems engineering analysis processes can be defined. the cost and schedule performance of the project. how well the implemented system ultimately satisfies the needs of the people who use it. Figure 43 is a systems engineering "V" model that graphically depicts the systems engineering approach. The core systems engineering project development processes that are the focus of this section are enclosed in a dashed box at the center of the "V". 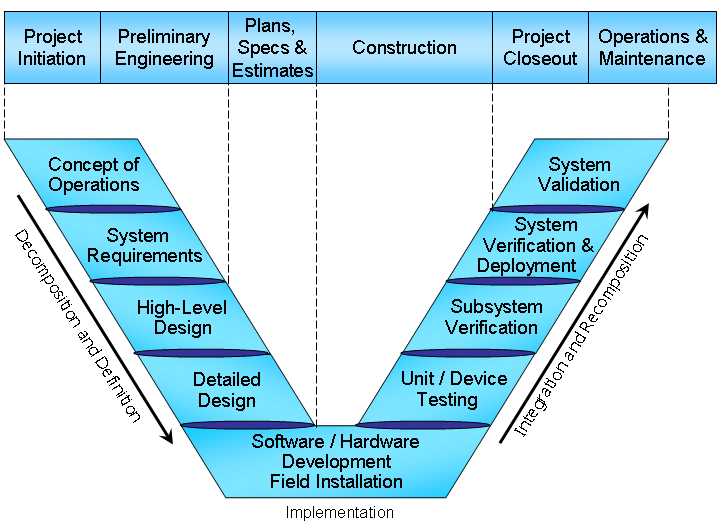 The "V" diagram also includes two wings that show the broader project lifecycle from initial project identification at the beginning of the lifecycle through system retirement or replacement at the end of the lifecycle. An important aspect of the systems engineering process is that the entire project lifecycle is considered during project development. A systems engineering approach requires up-front planning and system definition so that the project requirements are identified and documented, before technology choices are made and the system is implemented. On the left side of the diagram, the system definition progresses from a general user view of the system to a detailed specification of the system design. As development progresses, a series of documented baselines are established that support the following steps. 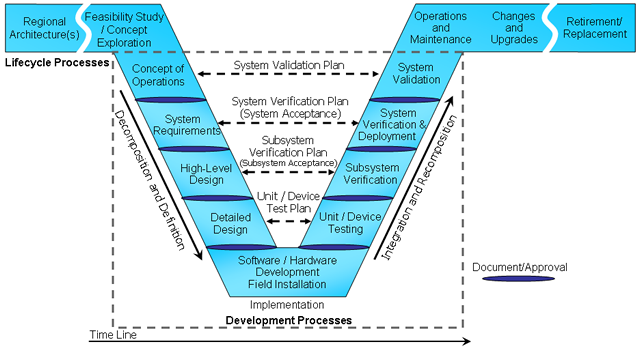 For example, a consensus concept of operations supports system requirements development. A baseline set of system requirements then supports system design. The hardware and software are implemented during coding and fabrication shown at the bottom of the diagram, and then the components of the system are integrated, tested, and verified in iterative fashion on the right. Ultimately, the completed system is validated to measure how well it meets the user's needs. Significantly, there is traceability from one step to the next and also traceability between steps on both sides of the diagram since the system definition that is generated on the left is used to verify the system on the right. The user needs that are identified in the very first step of the process are used to validate the completed system as part of system validation. In addition to the process steps identified in the "V", there are several cross-cutting activities that contribute to successful projects. Development of a systems engineering management plan (SEMP), configuration management, risk management, and project monitoring and control are all best practices that are associated with systems engineering that will benefit ITS projects. Following a system engineering approach during implementation of ITS projects is a key requirement of the Rule/Policy. However, providing guidance for systems engineering is beyond the scope of this document. For additional resources or training on system engineering, refer to the ITS Resource guide, (http://www.resourceguide.its.dot.gov/), the NHI website (http://www.nhi.fhwa.dot.gov/), or the International Council on Systems Engineering (INCOSE) website (http://www.incose.org) for more information. In addition to these national systems engineering resources, several states have developed systems engineering guidance for ITS projects including the Systems Engineering Guidebook for ITS, created by the FHWA California Division and Caltrans (http://www.dot.ca.gov/research/se_guidebook_ver1-12_14_05.pdf) and the Florida DOT Systems Engineering Management Plan (http://www.dot.state.fl.us/TrafficOperations/ITS/Projects_Deploy/SEMP.htm). As it evolved through a century of building roads and public transit systems, the transportation project delivery process used by most agencies today already includes many important features of the systems engineering process. In both processes, the system is specified in increasing detail, beginning with needs, moving to requirements, and then into design. Multi-disciplinary project teams and systematic stakeholder outreach and communications are hallmarks of a good transportation project development process and good systems engineering practice. By taking advantage of these similar concepts and processes, the systems engineering process can be integrated as an extension to the agency's existing project development process. This alignment of the traditional transportation project development process and the systems engineering process is shown in Figure 44. Making these types of linkages and mainstreaming ITS development into the agencies' project development process makes it easier to incorporate the regional ITS architecture as a tool in each agencies' process. The project development process is also influenced by the selected procurement strategy. ITS projects have been procured through traditional low bid, systems manager, design/build, task order, and other innovative procurement approaches. The procurement strategy will influence who (agency, consultant, or contractor) takes the lead for each process step, but the fundamental systems engineering process steps (Concept of Operations, Requirements, Design,...) should still be accomplished for all types of ITS procurements. 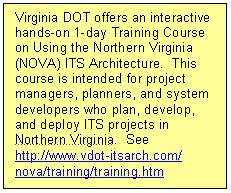 For additional resources or training on ITS procurement, refer to the ITS Resource guide, (http://www.its.dot.gov/itsweb/guide.htm) or the NHI website: http://www.nhi.fhwa.dot.gov/ for more information. US DOT recognized the potential benefit of a systems engineering approach and included requirements for a systems engineering analysis for ITS projects in the FHWA Rule/FTA Policy. The Rule/Policy requires a system engineering analysis to be performed for ITS projects that are funded through the highway trust fund. As shown in Figure 45, the Rule/Policy specifies seven requirements that the systems engineering analysis must include at a minimum. The systems engineering analysis requirements in the Rule/Policy focus on the first few steps of the systems engineering approach. The regional ITS architecture can be used to support the Rule/Policy requirements as well as the broader systems engineering approach that is recommended for ITS projects. Good systems engineering practice goes beyond the seven requirements in the Rule/Policy. Systems engineering is a systematic approach for defining, building, and validating systems that satisfy customer needs as described earlier in this section. A complete systems engineering approach also addresses planning, risk management, configuration management and other processes. Each Project Sponsor should use a systems engineering approach that can be tailored to fit the needs of a specific ITS project. The required systems engineering analyses identified in the Rule/Policy become "required" steps that cannot be tailored out. The complete systems engineering analysis required for ITS projects is defined in FHWA Rule 940.11 and FTA National ITS Architecture Policy Section 6. Sections 7.3.4 through 7.3.7 walk through the opportunities for using the information in a regional ITS architecture to support the steps in the systems engineering process. Each opportunity for architecture use is described in the order that it would occur during project development, as shown in Figure 46. Before the regional ITS architecture can be used, the portion of the architecture that is relevant to the project must be identified. The process of identifying the subset of the regional ITS architecture is described in section 7.3.4. Once the relevant portion is identified, the relevant components can be used to support the systems engineering process. The potential use of the regional ITS architecture to support each of the early process steps is described in sections 7.3.5 through 7.3.7. Since every regional ITS architecture is a bit different, each architecture's utility in supporting the systems engineering process will vary. For example, regional ITS architectures that include tailored functional requirements will provide a better starting point for project system requirements definition than regional ITS architectures that have fewer generic requirements. The region should take a candid look at the utility of their regional ITS architecture in the project implementation process and refine it over time so that it provides the best possible support for each project sponsor's systems engineering process. These three components define the system(s) that will be created or impacted by the project, the functionality that will be implemented, and the interfaces that will be added or updated. If integration opportunities are to be considered, the regional ITS architecture should be used as early in the project development lifecycle as possible. The architecture should be reviewed before firm project cost estimates are established, while there is still opportunity to adjust the scope to accommodate the functionality and interfaces identified in the regional ITS architecture. This opportunity may occur before or after programming/budgeting, depending on how specifically the ITS project is defined in the TIP/STIP or other programming/budget document. It can be difficult to find the components that apply to a project, particularly if the Project Team is unfamiliar with the regional ITS architecture. The best approach for identifying the portion of the regional ITS architecture for a particular project will vary since each regional ITS architecture is defined a bit differently. There are a few logical entry points to the regional ITS architecture that may be of use to the Project Team — chances are that one of these approaches will work best in your region. Transportation services, which are typically represented as market packages, are an excellent way to begin to isolate the portion of the regional ITS architecture that may apply. By identifying the service that the project performs and finding this service in the list of market packages included in the regional ITS architecture, the portions of the architecture related to that service can be identified and then tailored for the project. Note that in most cases, the market package will have to be further refined to precisely match the scope of the project. The connection between the regional ITS architecture and ITS projects is clearest if the project to be implemented is identified in the project sequencing portion of the regional ITS architecture documentation. If the project is identified and explicitly related to the regional ITS architecture in the project sequencing section, then this is probably the best entry point for the Project Team to use. If the project is not included in the project sequencing documentation, then feedback should be provided to the Architecture Owner so that the architecture can be updated to reflect the range of projects that are actually being implemented in the region. Depending on the architecture documentation, the Project Team could locate the target system(s) in the list of inventory elements or identify the stakeholder(s) associated with the project in the list of stakeholders. Depending on the linkages in the architecture documentation, one of these entry points can be used to find the portion of the regional ITS architecture that is most relevant to the project to be implemented. In order to facilitate use by numerous Project Teams, each region should define a roadmap for architecture use that takes advantage of the strengths of their specific regional ITS architecture. The roadmap should identify the best entry point(s) (e.g., Market Packages, Project Sequencing, Inventory Elements, etc.) for that architecture, how to locate the relevant item in the list, and how to navigate to other related items in the architecture documentation. In almost every case, the regional ITS architecture will identify integration opportunities that will not be included in the current project. Integration options may be deferred for many reasons — agencies on both sides of the interface may not be ready, there may not be sufficient funding or time available to implement everything, supporting infrastructure may not yet be completed, a necessary standard may not be available, implementing too much at once may incur too much complexity/risk, etc. It is important to explore these integration opportunities so that they are accounted for and supported in the project design, even though they may not be implemented with that specific project. The ultimate goal is to make ITS deployment as economical as possible by considering how this project will support future projects over time. To support this goal, future integration options that may impact the project design should be identified and considered in the project development. For example, additional stakeholders may be involved in the current project to ensure that future requirements are identified and factored into the current project design. The subset of the regional ITS architecture that is included in the project can be shown in a series of simple tables or a diagram from Turbo Architecture, as shown in Figure 47. This figure identifies the inventory elements and interfaces that will be implemented by the Maine DMS project. Functional requirements that are relevant to the project would also be extracted. A subset of these requirements are shown later in this chapter, in Table 15. As shown in the figure, the DMS project will include both portable and fixed dynamic message signs (represented as field devices in the regional ITS architecture), control software in the MaineDOT Communications Center, and an interface to the Condition Acquisition and Reporting System (CARS) so that sign information can be distributed as traveler information. 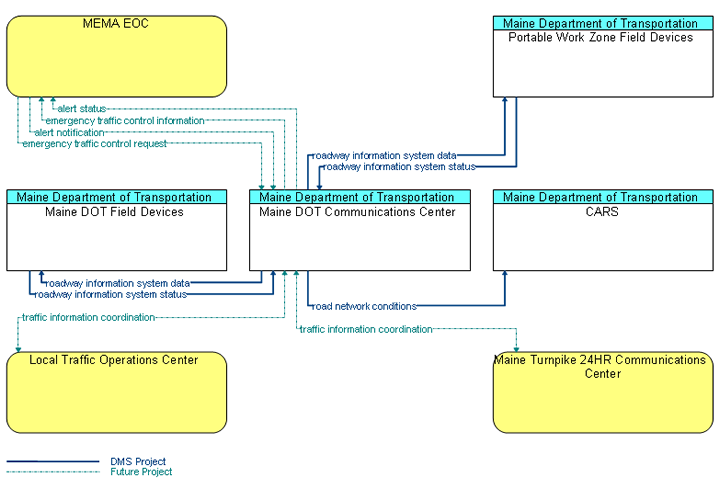 Future interfaces that are related to DMS operation from the regional ITS architecture including coordination with local cities to coordinate traffic diversions, coordination with the MEMA EOC to support use of the signs in emergencies, and coordination with the Maine Turnpike are also included in the diagram for context, although they are not included in this project. It is a good idea to include additional interfaces that are closely related to the project, as shown in the previous example. This gives some context for the project and conveys information to the project team about how this project will fit with other future projects. Where this is done, the documentation should be clear about the subset that is actually included in the current project. It is also important not to include too much additional information — the goal is to include only components that are in some way relevant to this particular project, particularly those that may influence project design decisions. If Turbo is used, then a project ITS architecture can be specified that collects together all the relevant portions of the architecture for that project. See the Turbo Architecture User's Manual and Turbo Architecture training course that is offered through the National Highway Institute (http://www.nhi.fhwa.dot.gov/) for more information. A well-defined regional ITS architecture provides a good starting point for developing a concept of operations (ConOps) for an ITS project. The purpose of the ConOps is to clearly convey a high-level view of the project to be developed that each project stakeholder can understand. The components of the regional ITS architecture provide a high-level description of the ITS systems in the region, which can often be directly incorporated into a project ConOps. Several of the regional ITS architecture components can be used, as shown in Figure 48, which relates the regional architecture to a typical outline for a ConOps based on the industry standard, ANSI/AIAA G-043-1992. The ConOps for an ITS project should include this information and many more details specific to the project as described in the following paragraphs. A ConOps should describe the system from the perspective of each stakeholder. The relevant stakeholders that are identified in the regional ITS architecture are a good starting point for the list of stakeholders considered in the ConOps. The Project Team may need to add stakeholders or provide additional specificity for selected stakeholders. For example, in the Maine DMS Project, the "MaineDOT" stakeholder identified in the regional ITS architecture is further distinguished into separate MaineDOT divisions — Planning, Maintenance and Operations, and Information Services because each MaineDOT division has a distinct role in the project. The agency roles and responsibilities that are specified in the ConOps can be derived from the operational concept that is included in the regional ITS architecture. This operational concept can serve as a starting point for a more detailed definition of the operational roles that are described in the ITS Project ConOps. The specification of participating agencies' roles and responsibilities is a required part of the Systems Engineering Analysis as specified in the Rule/Policy. The high-level functional requirements that are defined in the regional ITS architecture are frequently defined at a level that is commensurate with the operational needs that should be defined in the ConOps. The operational needs that are defined in the ConOps then provide a basis for the project requirements that are defined later in the systems engineering process. The high-level requirements from the regional ITS architecture can be included in the ConOps and modified and expanded as necessary so they represent the operational needs of the specific project. The ConOps includes a high-level project description that is normally supported by a high-level system block diagram. This system description can be based on the interfaces and information flows that are extracted from the regional ITS architecture. Depending on the regional ITS architecture and the nature of the project, the project description that is derived from the regional ITS architecture should be refined so that it is as easy to understand as possible in the ConOps. For example, Figure 49 is a block diagram for the example Maine DMS project that is derived from the regional ITS architecture diagram in Figure 47, but it is specifically focused on the DMS project (e.g., "DMS" is used rather than "Field Equipment" and controllers that are hidden in the regional ITS architecture are shown). The relationship to the regional ITS architecture that is developed for each project (see paragraph 7.3.3) should also be included in the ConOps. If the ANSI/AIAA outline is used for the ConOps, this information would logically fit in the Operational Environment paragraph, or the outline could be tailored and a specific "Relationship to the Regional ITS Architecture" paragraph could be added. System integration is as much an institutional challenge as it is a technical systems engineering exercise. The regional ITS architecture identifies regional agreements that may be relevant to the project. Necessary agreements should be identified for the project and listed in either the project plan or the ConOps. If the ANSI/AIAA outline is used, the list of agreements would logically fit in either the operational environment or support environment sections. The location of the list of agreements isn't so important as long as it is included in the document and the project plan addresses the creation of the necessary agreements. If necessary agreements are not represented in the regional ITS architecture, feedback should be provided to the Architecture Maintainer. The functional requirements and interfaces defined in the regional ITS architecture can be used to support system requirements definition as shown in Figure 50. The functional requirements associated with the inventory element(s) that are included in the project can be scanned to identify requirements that cover the required functionality for the project. These functional requirements can be one of the inputs to system requirements definition. In addition to the functional requirements, the project interfaces that are identified in the regional ITS architecture should also be supported by system requirements associated with each interface. Of course, the project's system requirements should be defined in greater detail than the high-level functional requirements that are included in the regional ITS architecture. The system requirements should also address performance, development, operations and maintenance, and other requirements that are typically not included in a regional ITS architecture as shown in Figure 51. While the requirements included in the regional ITS architecture are only a starting point, it is better to start with these requirements than it is to start from scratch. By starting with the regional ITS architecture requirements, the Project Team can get a head start and also maintain continuity between the regional ITS architecture and the region's projects. Requirements definitions are a required part of the Systems Engineering Analysis as specified in the Rule/Policy. The functional requirements associated with the project may be extracted and used as shown in the excerpt of requirements associated with the Maine DMS project in Table 15. MaineDOT Communications Center TMC Traffic Information Dissemination 1 The center shall remotely control dynamic messages signs for dissemination of traffic and other information to drivers. MaineDOT Communications Center TMC Traffic Information Dissemination 3 The center shall collect operational status for the driver information systems equipment (DMS, HAR, etc.). MaineDOT Communications Center TMC Traffic Information Dissemination 4 The center shall collect fault data for the driver information systems equipment (DMS, HAR, etc.) for repair. Each of these requirements from the regional ITS architecture would then be expanded into detailed functional requirements. For example, the single requirement to control the DMS signs that is included in the regional ITS architecture could be a high-level requirement that is expanded into many requirements for message definition, message management, message display, message scheduling, and message prioritization. The regional ITS architecture can be used by project designers as the starting point for the project high-level design and to identify the ITS standards that may be applicable to the project as shown in Figure 52. The subset of the regional ITS architecture identified in paragraph 7.3.3 forms the basis for the high-level or architectural design for the project. The subset of the regional ITS architecture should identify the key inter-agency interfaces (if any) that the project must support as well as major system interfaces. The project architectural design then adds significant detail, but retains traceability back to the architecture framework, as shown for the example Maine DMS project in Figure 53. By developing an architectural design for the project that maps back to the regional ITS architecture, there is traceability through the process, connecting planning and implementation. The regional ITS architecture includes a map to ITS standards that can be used to identify the applicable ITS standards for the project. For example, the standards that are identified in the regional ITS architecture for the example Maine DMS project are shown in Table 16. The standards that are identified in the architecture are only a starting point for the project design specification. Typically, only a subset of the identified standards will actually be used in the project and substantial detail must be included in the specification to identify the portions of the standard that are relevant to the particular procurement. Some regions have created standards plans as part of their architecture that define the approach for incorporating standards into ITS projects over time. If such a plan exists, it should be consulted for guidance on standards implementation. Feedback should also be provided to the regional architecture maintenance organization if the standards plan does not accurately reflect the preferred use of standards on the project. Section 6.3.3 describes ITS standards plans in more detail. Several resources describe how to specify ITS standards requirements for ITS procurements. The ITS Standards Program web site includes the most current information on ITS standards, including available deployment resources (http://www.standards.its.dot.gov). The specification of applicable ITS standards is a required part of the Systems Engineering Analysis as specified in the Rule/Policy. Project Teams that use the architecture will be one of the most significant sources for regional ITS architecture maintenance changes. As projects are implemented, they will be mapped to the architecture, and a significant portion of the architecture will be closely reviewed in the process. Each region should define a mechanism that allows each Project Team to provide comments to the architecture with minimal time investment. Many of the components of the regional ITS architecture may be improved through feedback from architecture use, as shown in Figure 54. As discussed in paragraph 7.3.1, a checkpoint in the process should be identified where each project reviews the as-built project design and submits any comments to the regional ITS architecture, in the same way that as-built plans are submitted for traditional construction projects. There are a few key steps that can be taken to implement a good architecture feedback process and ultimately improve the quality of the regional ITS architecture. First, there must be some rigor to the process that supports architecture feedback so that architecture feedback isn't forgotten in the rush to complete the project. Second, good configuration management practices are required, both for the project development team and the architecture maintainer so that needed changes are captured, accrued, and properly incorporated over time. Regional ITS Architecture maintenance is discussed in detail in Section 8. Several regions have implemented on-line forms and e-mail links that make it easier for Project Teams to provide architecture feedback. 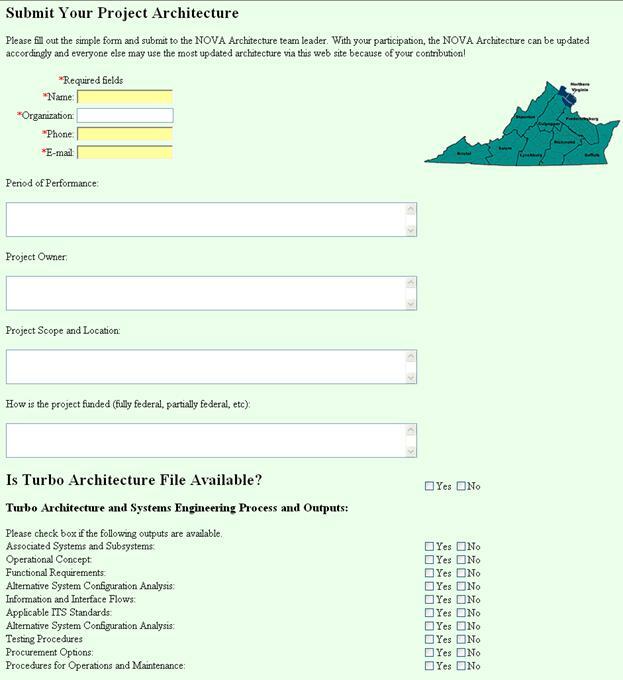 For example, VDOT provides an on-line form for architecture comments on their Northern Virginia (NOVA) ITS Architecture web site. Another form (see Figure 55) allows Project Sponsors to easily notify the NOVA Architecture Team leader of new Project Architectures that should be reflected in the NOVA Architecture. Architecture maintainers can also use programming documents, capital plans, project documentation, and general knowledge and involvement in the region to identify architecture impacts from ITS projects that may not be reported.